Rauchspurpatrone Gelb. 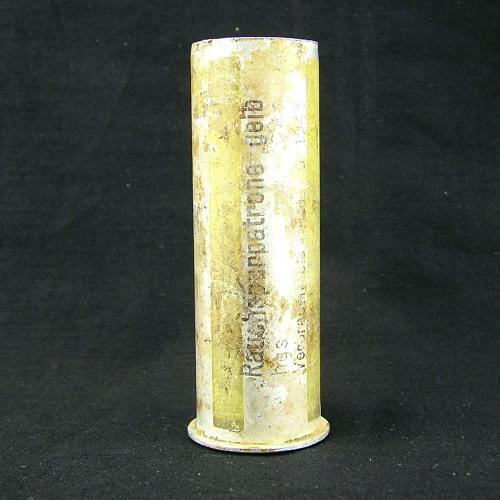 Luftwaffe yellow smoke flare cartridge. Aluminium and approximately 8cm in length x 3cm diameter. Flare pistols were carried by both fighter and bomber crews for use with signal, parachute and smoke flares. The cartridges were worn around the waist or legs on belts or 'bandoliers'. The cartridge has been fired and is completely empty/inert and totally safe. It has markings denoting the type of flare and has an April 1941 production date plus a 31 May 1945 'use by' date. Great for display. Not commonly found. We have a few of these available, all are priced individually. The first photograph shows the flares grouped together. Remaining photographs show the one offered for sale in this listing. Stock code S23428.